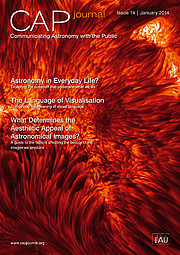 The 14th issue of Communicating Astronomy with the Public (the CAPjournal) is out now! This issue includes articles from Pamela Gay on science communication with Google+, and Edward Gomez on how to engage with celebrities in astronomy outreach through Twitter. In the resources, research and applications section we look at Hertzsprung and Russell, and the legacy of using flow maps to illustrate astronomical data. There is also an article on quantifying the aesthetic appeal of outreach images. Ryan Wyatt writes on how visual language and visualisation can be used to communicate astronomy, and there is a report on the Communicating Astronomy with the Public 2013 conference, which took place in Warsaw, Poland, in October. There is all this, and more, in this free, peer-reviewed journal for astronomy communicators — now available for download.